Summer of 2018 - a summer of heat and drought but Grabflies’ Jeff Layton and friend Dave Robinson video some of their Steelhead fishing trips in British Columbia (Skeena and Bulkley Rivers) and Washington State. This is the full length video. Steelhead in Home Waters - video footage, 25 mins. (2017 - February 2018) in the local waters that Jeff Layton of Grabflies.com fishes. This video highlights some of the local fisheries that Grabflies.com fished in 2017. Rivers fished in this movie are: Washougal, Klickitat, Deschutes, and the Olympic Peninsula rivers. Watch Grabflies.com and friends journey north to British Columbia and swing flies and fish the Skeena and Bulkley rivers in summer and fall of 2017. Winter 2017, record rain fall in the Pacific NorthWest. Fishing is tough, but Grabflies.com gang finds some big Steelhead while swinging flies through many rivers on the Olympic Peninsula and the PNW rivers. Beautiful scenery and Chrome Fish. This week (1-30-2017) I, Jeff Layton caught this 20 LB, 40 inch, Steelhead, close to my shop and home on the Washougal River, Washington. This is short quick video. More will come later. Watch Jeff Layton of Grabflies.com, and Dave Robinson, fish for Steelhead in Washington State. Jeff fishes the Klickitat River, and Dave fishes the Cowlitz and Klickitat river. The action picks up after Chrome Action in mid July 2016. Jeff and Dave swing flies for summer Steelhead using double handed Spey Rods. 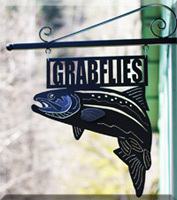 Watch GrabFlies.com, Jeff Layton and fishing comrade Dave Robinson, swing flies for Salmon in the Pacific Northwest. 24 mins. Steelhead Fly Fishing (Spey), from May 3, 2016 - July 7 2016. Location Pacific Northwest, BC Canada. Presented by Grabflies.com - Watch Two Spey fishermen Jeff Layton, and Dave Robinson fish and catch Steelhead. Video is 19 minutes long. Filmed in the Pacific NW, beautiful scenery and rivers as the group travels and fishes different rivers. Winter Steelhead Fly Fishing, from December 2015 - April 2016. Location Pacific Northwest, BC Canada. Presented by Grabflies.com - Watch four Spey fishermen catch one Steelhead each in this first of two videos: 15 LB, 18 LB., 23 LB., and 25 LB. Video is 18 minutes long. Filmed in the Pacific NW and BC, beautiful scenery and rivers as the group travels and fishes different rivers. Summer 2015 Steelhead fly fishing in the Pacific Northwest. Watch Grabflies swing flies for summer Steelhead - 26 minutes long. Steelhead Fly Fishing Movie, 28 minutes long. Filmed in Washington and Oregon in the Pacific Northwest. Jeff Layton of Grabflies.com is the main character but he has a couple of friends along for the journey. This movie is about swinging flies for Steelhead. This movie is titled Reel Scream for a reason. Lots of screaming reel action, fly fishing for Steelhead in the Pacific Northwest. Double Handed Spey Rod Action! OUT of the Box, FUNNY - UNIQUE - ACTION! A movie you will want to watch over and over again. Most of the film is shot in "point of view" perspective, suggesting that the viewers perspective is the same as the protagonist's. Storyline of this film is about a patient/fly fishermen talking with a fictional therapist about his addiction to fly fishing for Steelhead. Cowlitz, Clackamas, Deschutes, Hoh, Klickitat, North Umpqua, South Umpqua, Washougal, and Wilson rivers. Why should you get this movie - because there is no other one like it. Topics include: Roll cast, Switch cast, Single Spey, Double Spey, Snake Roll, Snap T, Skagit Casting, Overhead Cast, Spey casting in saltwater and single handed SPey casts - plus more . . .